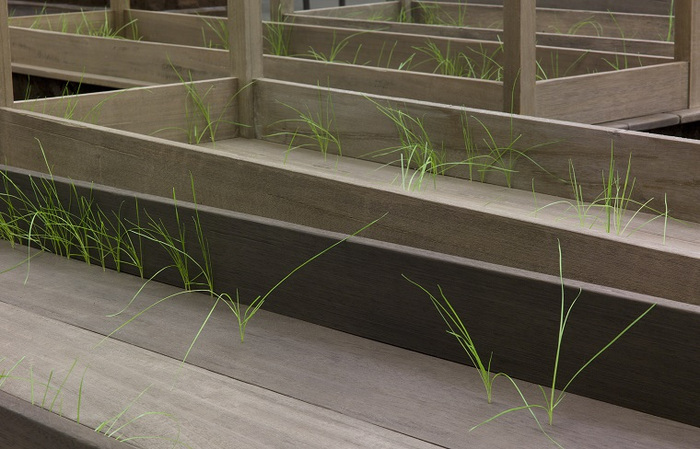 Doris Salcedo, Plegaria Muda, wood, concrete, earth, and grass, one hundred and sixty-six parts, each: 64-5/8 x 84-1/2 x 24 in., overall dimensions variable, 2008-10, installation view, MUAC, 2011, Mexico City. Inhotim Collection, Brazil, Reproduced courtesy of White Cube. Photo: Jason Mandella. The Museum of Contemporary Art (MCA) Chicago presents the first survey of the work of renowned sculptor Doris Salcedo. Salcedo—who lives and works in Bogotá—gained prominence in the 1990s for her fusion of postminimalist forms with sociopolitical concerns. Her work addresses the experience of loss and trauma due to systemic violence, and evokes the significance of bearing witness and processes of collective healing. The exhibition features all major bodies of work from the artist's twenty-five-year career—most of which have never been shown together before—as well as the American debut of her recent major work Plegaria Muda (Silent Prayer) (2008–10). Salcedo will also create a new large-scale public project in Chicago in fall 2014, responding to the issue of gun violence in the city. In conjunction with the exhibition, the MCA will produce a short film documenting Salcedo's site-specific and ephemeral installations—works that either no longer exist or are otherwise impossible to display in the galleries of the museum—and a 184-page publication featuring full-color illustrations and an overview of the artist's career by leading scholars and curators. 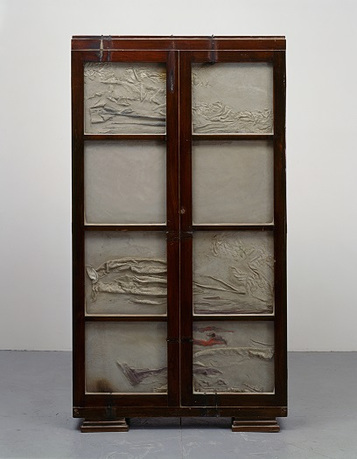 Colombian sculptor Doris Salcedo was born in Bogotá in 1958. She received her BFA from the Universidad de Bogotá Jorge Tadeo in 1980 and went on to complete her MFA at New York University in 1984. She then returned to Bogotá where she continues to live and work today. Since the mid 1980s, Salcedo has created sculptures based on the profound trauma of Colombia's social and political history, frequently drawing from specific testimonies of Bogotá residents. 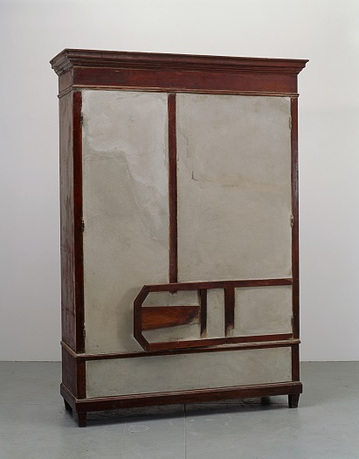 In early series such as Atrabiliarios (Defiant) (1992–2004) and La Casa Viuda (A Widow's House) (1992–95), the artist incorporated chairs, tables, clothing, and other domestic objects belonging to victims of violent crime and kidnapping into sculptures that evoke the absence of a loved one. 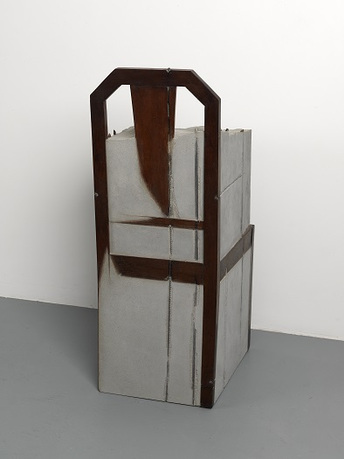 Later series, like Plegaria Muda (2008–10), carry on the sense of healing and reparation in the careful and laborious processes of their making. Over the course of her career, the themes of absence, grief, and memory have evolved into a broader critical commentary on international political violence, as seen in her large-scale public and site-specific projects, such as Noviembre 6 y 7, an outdoor installation at the Palace of Justice, Bogotá (2002) and Act of Mourning, an intervention in the Plaza de Bolivar, Bogotá (2007). 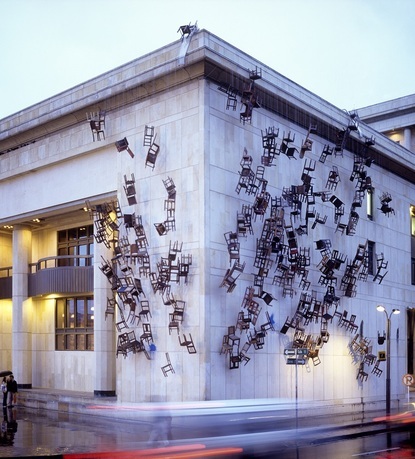 In 1550 Chairs Stacked between Two City Buildings at the Eighth Istanbul Biennial (2003), Salcedo disrupted the functional and familiar characteristics of the household object by creating an imposing two-story wall of chaotically interlocked chairs. With Shibboleth (2007), her major project for the Turbine Hall at the Tate Modern, London, Salcedo created a crack in the concrete floor running the length of the massive gallery space as a meditation on international borders and the history of racism and inequality among countries. She has exhibited in group and solo exhibitions internationally, including Documenta XI (2002) and XXIV São Paolo Biennial (1998). In addition, her solo exhibitions include those at the Menil Collection, Houston (2012); Museo Nazionale delle Arti delle XXI Secolo (MAXXI), Rome (2012); the Tate Gallery, London (2007 and 1999); White Cube, London (2012, 2007, 1995); the San Francisco Museum of Modern Art (2005 and 1999); and the New Museum of Contemporary Art, New York (1998). In 2005, Salcedo won the Ordway Prize from the Penny McCall Foundation, and in 2010 she was awarded the Premio Velázquez by the Spanish Ministry of Culture. Madeleine Grynsztejn is Pritzker Director of the Museum of Contemporary Art Chicago. Her vision is to make the MCA an artist-activated, audience-engaged platform for producing art, ideas, community, and conversation around the creative process. 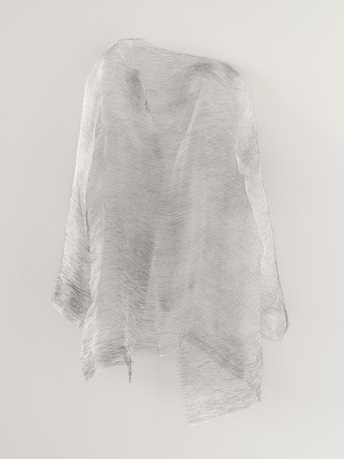 Recently featured on the cover of Art in America, Grynsztejn has curated major exhibitions on renowned contemporary artists including Luc Tuymans, Olafur Eliasson, and Richard Tuttle, the last of which received a 2006 “Best US Monographic Museum Show" award from the Association of International Art Critics. Grynsztejn was born in Lima, Peru, and raised in Caracas, Venezuela, and London, England. She is a frequent lecturer, moderator, and panelist on topics regarding the arts, museum practices, and various cultural subjects. Julie Rodrigues Widholm is curator at the Museum of Contemporary Art Chicago. Recently, she co-organized Argentinean artist Amalia Pica's first American museum survey with the MIT List Visual Arts Center. In 2012, she curated the first major solo museum of the work of Rashid Johnson, Rashid Johnson: Message to Our Folks (2012), which traveled to the Miami Art Museum (2012), the High Museum of Art, Atlanta (2013), and the Mildred Lane Kemper Art Museum, St. Louis (2013). Since joining the MCA Chicago in 1999, she has curated international group exhibitions such as Escultura Social: A New Generation of Art from Mexico City (2007), as well as in-depth presentations of the MCA Collection, and has assisted with major international touring exhibitions such as Tropicalia: A Revolution in Brazilian Culture (2005) and The Short Century: Independence and Liberation Movements in Africa, 1945 to 1994 (2001), among others. In addition, she has curated solo exhibitions at the MCA featuring the work of dozens of Chicago-based artists, including, recently, Scott Reeder, Laura Letinsky, Molly Zuckerman-Hartung, and Cauleen Smith. Michael Darling, the James W. Alsdorf Chief Curator, joined the MCA in July 2010 after an international search. Darling is formerly the Jon and Mary Shirley Curator of Modern and Contemporary Art at the Seattle Art Museum (SAM) where he played a pivotal role in the reopening of the expanded downtown museum that tripled the space for contemporary art. Darling has worked as an independent writer and curator, contributing essays on art, architecture, and design to publications including Frieze, Art Issues, Flash Art, and LA Weekly. He received his BA in art history from Stanford University, and his MA and PhD in art and architectural history from the University of California, Santa Barbara. Darling frequently serves as a panelist, lecturer, and guest curator on contemporary art and architecture. Founded in 1967, the mission of the Museum of Contemporary Art Chicago is to be an innovative and compelling center of contemporary art where the public can directly experience the work and ideas of living artists, and understand the historical, social, and cultural context of the art of our time. The museum boldly interweaves exhibitions, performances, collections, and educational programs to excite, challenge, and illuminate our visitors and to provide insight into the creative process. The MCA aspires to engage a broad and diverse audience, create a sense of community, and be a place for contemplation, stimulation, and discussion about contemporary art and culture.